Let them choose the art they want! Help someone (or yourself) get the art they want! The $295 denomination covers the cost of a three-day workshop. 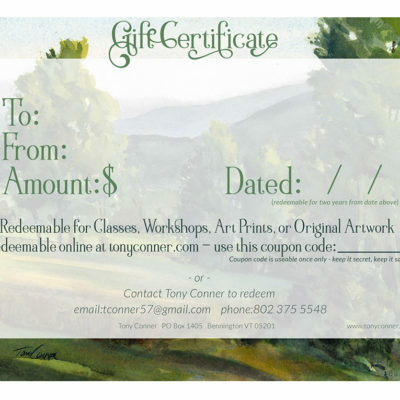 All gift cards are redeemable for original paintings, limited edition and specialty prints, classes & workshops, or commissioned artwork. Gift cards are not redeemable for cash. Cash value 1/20th of one cent. All cards are redeemable for original paintings, limited edition and specialty prints, classes & workshops, or commissioned artwork.